After a devastating riding accident, a young girl and her beloved horse are left with serious physical and emotional scars. When her mother calls on the "Horse Whisperer" to help, she meets a rugged rancher who not only has an extraordinary gift with animals, but also an ability to enrich the lives of people around him. Download The Horse Whisper in Digital HD from the iTunes store. 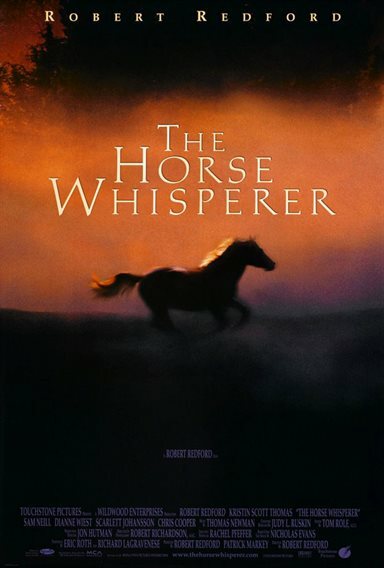 The Horse Whisper images are © Touchstone Pictures. All Rights Reserved. Toward the middle of "The Horse Whisperer," Robert Redford locks eyes with his co-star. They stare at each other for a long time without speaking, as if the depth of their feeling can't be expressed in words. Redford has had this intense chemistry with many actresses over the years, but in this case the eyes he is looking into belong to a horse. It says something about this movie that Redford is at his most compelling playing opposite a mare. The central character, Tom Booker -- a Montana cowboy with an ability to straighten out troubled horses -- is the kind of rebellious role that would appeal to Redford. It appealed to him so much that he agreed to direct himself for the first time, and his passion for the subject matter comes through in every lovingly crafted frame. Redford interprets Tom as a Sigmund Freud of the range, able to read his patients' ills by close observation. But his quiet superiority becomes irritating when Tom thinks he has the answers to humans' problems as well. When Annie (Kristin Scott Thomas), a hyperkinetic magazine editor from New York, arrives on his doorstep with an injured daughter, Grace (Scarlett Johansson), and an injured horse, Pilgrim, Tom of course knows how to treat the lot of them. He gets Grace, who has lost part of a leg as a result of a riding accident, to believe in herself again and whispers to Pilgrim that the accident wasn't his fault. After convincing Annie that her big-city ways are causing her unnecessary stress -- the wide-open spaces sure look better than the cramped ones she left behind -- Tom gets her to fall in love with him, even though she has a perfectly fine husband back home. Everything is building up to this romance, but it doesn't come until two hours into the film and by then, it feels anti-climactic. As good as Redford and Scott Thomas are at the outset, they can't convey the passion necessary to make the affair believable. Their close-ups make it impossible to overlook the fact that Scott Thomas is young enough to be Redford's daughter. Redford deserves credit for not shooting himself through a filtered lens. But couldn't he do anything to pick up the pace? "The Horse Whisperer" appears to stretch on forever. When Annie's husband (Sam Neill) belatedly shows up at the ranch, he asks Tom, "How much longer will this take?" -- a question the audience may be wondering as well. Redford, whose first ambition was to be an artist, paints pictures on the screen. His shots of the vast landscape as Annie and Grace drive across the country are breathtaking. But he diminishes the effect by over doing it. He also uses too many reaction shots. When Tom tries to get Grace to ride Pilgrim again, her parents and everybody on the ranch stand around and watch. Redford keeps the focus on their eyes instead of on her. Johansson is an unusually subtle actress, especially considering her young age. She doesn't resort to histrionics to show Grace's anguish. But Dianne Wiest, miscast as a rancher's wife, seems to have wandered in from a Woody Allen movie. The script is unable to connect the disparate elements of the story; the result is a choppy movie. There's the New York part, the cross-country part, the Montana part. The last is clearly Redford's favorite. As an actor and director, he's the most at home on the range. Available on Blu-ray for the first time, there isn't too much here to get yourself in a tizzy over. The film certainly looks and sounds great thanks to the magic of Blu-ray, but everything is on one disc. There are 3 docs: a production feature, one spot lighting Redford and the last on Buck Brannaman. Then there is a music video, which seems wholly unnecessary even with the minimal amount of bonus material. 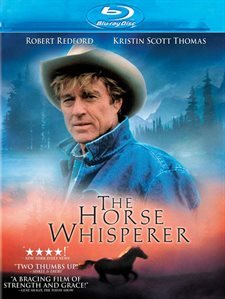 As far as Blu-ray's go The Horse Whisperer doesn't offer much and the same can be said for the film itself.